I'm new to Axoloti and technically weak. I see I should use a stereo splitter cable. Don't have one. In the uk where could you suggest I go to get one,please? I've looked on Studiosoares, Amazon and EBay and everywhere seems to sell single stereo 1/4 inch to dual mono or to rca. I have plenty of mono cables. And haven't tried those as I believe I'd get distortion.thank you for your help. I bought one of these and it works great! Backed by Hosa's Limited Lifetime Warranty, this quality 'Y' cable features precision-molded terminations, braided shields, and heavy-duty insulation. Limited Lifetime Warranty. Ideally I'd need a cable that went 1/4 inch to 1/4inch so to go direct to my sound card. Any suggestions? With yours Id need more cables with 3.5mm heads. I think. 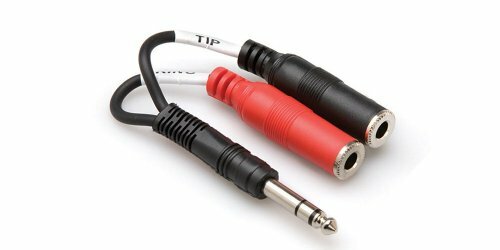 Single stereo 1/4" to dual mono 1/4" is a splitter and should do what you want. I have plenty of mono cables. And haven't tried those as I believe I'd get distortion. That was an issue with board revision 1.0 and is fixed on later revisions. You can find the board revision near the edge of the board close to the audio input jack. Stereo to dual mono 1/4" cables are often called "insert cables". Ok thanks for your replies, I am grateful. So would I be able to just use the 1/4 inch mono Jack cables I already have? I hope so. Sorry that I missed the note re. The update. So would I be able to just use the 1/4 inch mono Jack cables I already have? I hope so. If you have no need for stereo, and board rev. 1.1 or later, a 1/4" mono jack cable is perfectly fine. thanks. Tbh. I've been really dim. I saw the two sockets and assumed it was only stereo out, and looking I see exactly what would have been obvious if I'd have-looked. Duh. What a silly. Anyhow, these look exactly what I'd need. Thanks one and all. i have tried several cables (DieHard, Klotz...) Stereo to Dual Mono - Does not work. Still get a distorted Audio signal. Same as with Mono Cables (known from the Manual) The headphones Jack is working. 1/4" TRS jack at one and and 2 mono jacks at the other. wondered about the advisability of connecting one channel directly to ground by plugging in a mono jack into the stereo sockets. good idea, Ive updated quick start guide, and also amended the hardware notes.